The Kaiserslautern Military Community (KMC) includes the US Army Garrison Kaiserslautern and is also home to Ramstein Air Force Base. The KMC is the largest American military community outside the United States with more than 45,000 US citizens and is slated to become even more important under current transition plans. It will become the logistics hub, and one of just four main operating areas left in Europe after the plans are completed. As such it has, and will continue to have, virtually every facility imaginable. 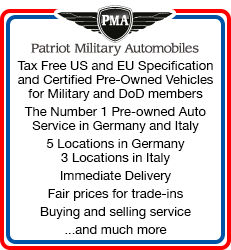 U.S. Army facilities located there include the Rhine Ordnance Barracks, Landstuhl Regional Medical Center, 21st Theater Sustainment Command (TSC) and the European Headquarters of the Defense Commissary Agency. The European Stars and Stripes also recently moved there from Darmstadt. The Vogelweh Housing Area, sometimes known as "KMC West," is the center of Army activities in the area. It accommodates more than 10,000 soldiers and their family members with housing, schools, the commissary, dental clinic, a community center, Military Police and several all rank clubs. The American military is an important industry in the area. There was little reconstruction and a slow economy following World War II. Then, in 1952, the Americans moved in. This brought money to the area. Since then the city has been almost totally rebuilt. The towering modern city hall (Rathaus) was built from 1964-1968. 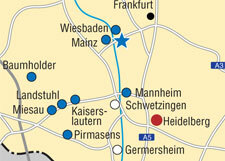 Kaiserslautern annexed several surrounding villages in 1969 and now its population is approximately 100,000. It prides itself on having one of Germany's major league soccer teams. For further information check the website at http://www.rp.army.mil/. Sports and Recreation. The Fitness Center has a well-trained staff, convenient hours of operation, locker rooms and a full array of fitness equipment. The Rod and Gun Club provides excellent German hunting and fishing opportunities, as well as bargain resale activities. Ranges accommodate rifle and pistol shooters and archery enthusiasts. Outdoor Recreation offers economical ski trips and packages to ski resorts in Austria, Italy, Switzerland, France and the Edelweiss Lodge and Resort in southern Bavaria. The modern bowling center offers multiple-lane facilities, pro shops, snack bars, game rooms and conference rooms. The worldwide United Service Organization (USO) sells tickets to concerts and other special events in and around Germany. The Kazabra, Armstrong and Landstuhl Clubs offer fine dining, an assortment of snacks, live entertainment, excellent brunches, karaoke bars, wide-screen televisions, unit and group nights, plus many other programs and activities. USAREUR's premier medical facility, the Landstuhl Army Regional Medical Center, is in USAG Kaiserslautern. A new addition to its extensive array of facilities is a Child Development Center. Patient liaison officers are available to assist people who may need special services available only at local German facilities. Dental facilities in the USAG provide general dentistry and specialty treatment to authorized individuals. Veterinary Services include animal disease prevention and control, issuance of health certificates and vaccinations. There are 5 schools in the USAG Kaiserslautern. They are Kaiserslautern Elementary School (K-5), Kaiserslautern Middle School (6-8), Kaiserslautern High School (9-12) Landstuhl Elementary/Middle (K-6) and Vogelweh Elementary School (K-5). There are at least 4 chapels in the USAG Kaiserslautern. 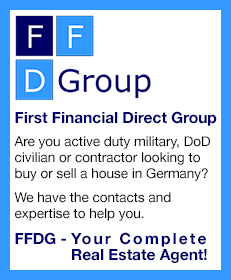 They are at Daenner, Landstuhl, Miesau and Kapaun. They offer not only Catholic and Protestant services, but also Eastern Orthodox, Jewish, Islamic, Seventh Day Adventists and Assemblies of God. Mega Mall. The Kaiserslautern Military Community Center, the new high-rise hotel and shopping mall complex opened at Ramstein Air Base in late 2009. It was three years late, but it was worth waiting for. It includes an eight-story, 350-room hotel, parking for 2,800 cars, a four-screen movie theater, the largest exchange in Europe, dozens of smaller stores and a host of eateries. The Defense Commissary Agency Europe (DeCA) is headquartered at Kapaun Air Station in Kaiserslautern, and two of the biggest commissaries under its control are at Ramstein and Vogelweh. Both stores are seven-day operations with ample shopping space and numerous checkouts, including four self-checkouts. The Libraries at Kleber, Landstuhl and Miesau have fiction and nonfiction book selections, reference materials, travel guides, videos, educational resources, children's books, magazines and computers with internet access. The guesthouses at Kaiserslautern and Landstuhl offer affordable and comfortable alternatives to local hotels and pensions. The Army Post Offices (APOs) at Kapaun and Daenner are full-service facilities, providing parcel service and transport of all classes of mail from priority to express. They also transport mail for free from APO to APO when "MPS" is written in the upper right corner of envelopes and packages. The Community Banks at Vogelweh, Kleber and Landstuhl and Service Credit Union at Vogelweh, offer full service banking. Automatic teller machines (ATMs) are there 24/7 for deposits and withdrawals from both checking and savings accounts. The Auto Skills Centers on Pulaski and at Landstuhl offer assistance in performing automotive maintenance and repair. Equipment, tools and trained mechanics make everything, from charging a battery to major overhauls, possible at great cost savings. The Playhouse at Kaiserslautern produces live plays and musicals, and stage concerts and talent contests, offering an outlet for the skills of actors/actresses and technicians.